اسحقی اسکوئی, ابوذر, حقیقی یزدی, محتبی, چوپانی, نقدعلی. (1395). بررسی چقرمگی شکست ویسکوالاستیک ماده پلیمری ABS تحت بارگذاری مود ترکیبی با استفاده از دستگاه آرکان. علوم و فناوری کامپوزیت, 3(2), 131-138. ابوذر اسحقی اسکوئی; محتبی حقیقی یزدی; نقدعلی چوپانی. "بررسی چقرمگی شکست ویسکوالاستیک ماده پلیمری ABS تحت بارگذاری مود ترکیبی با استفاده از دستگاه آرکان". علوم و فناوری کامپوزیت, 3, 2, 1395, 131-138. اسحقی اسکوئی, ابوذر, حقیقی یزدی, محتبی, چوپانی, نقدعلی. (1395). 'بررسی چقرمگی شکست ویسکوالاستیک ماده پلیمری ABS تحت بارگذاری مود ترکیبی با استفاده از دستگاه آرکان', علوم و فناوری کامپوزیت, 3(2), pp. 131-138. اسحقی اسکوئی, ابوذر, حقیقی یزدی, محتبی, چوپانی, نقدعلی. بررسی چقرمگی شکست ویسکوالاستیک ماده پلیمری ABS تحت بارگذاری مود ترکیبی با استفاده از دستگاه آرکان. علوم و فناوری کامپوزیت, 1395; 3(2): 131-138. امروزه پلیمر ABS به‌طور فزاینده‌ای در صنایع مختلف استفاده می‌شود. افزایش تقاضا برای این ماده در کاربردهای مختلف، نیازمند شناخت دقیق‌تر رفتار آن در حین شکست می‌باشد. در این تحقیق، رفتار شکست مود ترکیبی پلیمر ABS به‌صورت عددی و آزمایشگاهی بررسی شده است. آزمایش‌ها با استفاده ار دستگاه اصلاح شده آرکان صورت گرفته است که در آن با تغییر زاویه بارگذاری از 0 تا 90 درجه، مود یک خالص، مود دوی خالص و تمامی مودهای داخل صفحه قابل بررسی می‌باشند. همچنین تحلیل‌ المان محدود برای محاسبه ضرایب هندسی، که در محاسبه مقادیر چقرمگی شکست مورد نیاز می‌باشند، انجام شده است. 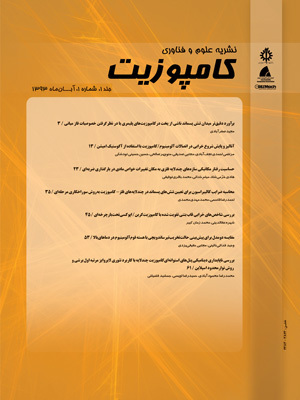 در این تحقیق رفتار ویسکوالاستیک برای نمونه‌ مورد آزمایش در نظر گرفته شده است. بنابراین انتظار می‌رود که مقادیر ضرایب شدت تنش وابسته به زمان (فرکانس) باشند. بنابراین با استفاده از اصل تناظر و با فرض شکست الاستیک خطی، مقادیر چقرمگی شکست مود ترکیبی وابسته به زمان برای پلیمر ABS تعیین شد. نتایج حاکی از آن است که در آزمایش ورودی کرنش ثابت، در تمامی شرایط بارگذاری، با گذشت زمان از مقادیر چقرمگی شکست، تا یک زمان مشخص، کاسته می‌شود. بنابراین می‌توان نتیجه گرفت که حداقل مقدار چقرمگی شکست پلیمر ABS، که نقش تعیین کننده‌ای در کاربردهای مختلف دارد، در لحظه اول بارگذاری اتفاق نمی‌افتد. ABS (Acrylonitrile butadiene styrene) polymeric material is widely used in different industries. The increasing demand of ABS for different applications has required a thorough understanding of its fracture behavior. This paper investigates mixed-mode fracture behavior of ABS polymeric material based on experimental and numerical analyses. Experiments were conducted on modified Arcan set-up. By varying the loading angle from 0° to 90°, pure mode-I, pure mode-II and a wide range of mixed-mode data were obtained experimentally. Also, finite element analysis was carried out for different loading conditions in order to determine correction factors needed for fracture toughness calculations. In this study viscoelastic behavior was considered for ABS specimens. Therefore, it is expected that the values of stress intensity factors to be time (frequency) dependent. Consequently, based on correspondence principle and assuming linear elastic fracture mechanics, time dependent mixed-mode fracture toughness for ABS polymeric material was determined. Results indicated that in all loading conditions, values of fracture toughness decrease while time increases in stress relaxation test, until a specific time. Accordingly, it can be resulted that the minimum value of fracture toughness of ABS, which plays a crucial role in various applications, does not appear in the first instance of loading. KWON, H. J. JAR, P.-Y. B. and XIA, Z., “Residual Toughness of Poly (Acrylonitrile-Butadiene-Styrene) (ABS) After Fatigue Loading - Effect of Uniaxial Fatigue Loading,” The Journal of Materials Science, Vol. 39, pp. 4821-4828, 2004. Lu, M.L. Chiou, K.C. and Chang, F.C., “Elastic-Plastic Fracture Toughness of PC/ABS Blend Based on CTOD and J-Integral Methods,” Polymer, Vol. 37, No. 19, pp. 4289-4297, 1996. Mai, Y.W. and Cotterell, B., “Effect of Specimen Geometry on the Essential Work of Plane Stress Ductile Fracture,” Engineering Fracture Mechanics, Vol. 21, No. 1, pp. 123-128, 1985. Mazidi, M. M. Aghjeh, M .K. R. and Abbasi, F., “Evaluation of Fracture Toughness of ABS Polymers via the Essential Work of Fracture (EWF) Method,” Journal of Materials Science, Vol. 47, No. 17, pp. 6375–6386, 2012. Es’hagi Oskui, A. Choupani, N. and Haddadi, E., “Experimental and Numerical Investigation of Fracture of ABS Polymeric Material for Different Sample’s Thickness Using A New Loading Device,” polymer engineering and science, Vol. 54, No. 9, pp. 2086-2096, 2014. Yin, Z.N. Fan, L.F. and Wang, T.J., “Experimental Investigation of the Viscoelastic Deformation of PC, ABS and PC/ABS Alloys,” Materials Letters, Vol. 62, No. 17-18, pp. 2750–2753, 2008. Yin, Z.N. and Wang, T.J., “Deformation Response and Constitutive Modeling of PC, ABS and PC/ABS Alloys Under Impact Tensile Loading,” Materials Science and Engineering A, Vol. 527, No. 6, pp. 1461-1468, 2010. Nishikawa, K. Hirose, Y. Urakawa, O. Adachi, K. Hatano, A. and Aoki, Y., “Ultrasonic Absorption and Relaxation in ABS Composite Polymer,” Polymer, Vol. 43, No. 4, pp. 1483-1490, 2002. Torabi, A. and Amininejad, S., “Experimental and Theoretical Fracture Analysis of Quasi-Brittle Polymer Components Containing V-Notches with End Holes Under Combined Tensile-Shear Loading,” Journal of Science and Technology of Composites, Vol 2, No 2, pp. 41-54, 2015. Reeder, J.R., “Refinements to the Mixed-Mode Bending Test for Delamination Toughness,” Journal of Composites Technology & Research, Vol. 25, No. 4, pp. 191-195, 2003. Hashemi, S. Kinloch, A.J. and Williams, J.G., “The Analysis of Interlaminar Fracture in Uniaxial Fiber-Polymer Composites,” Proceeding of the Royal Society of London Series A-Mathematical Physical and Engineering Science, Vol. 427, No. 1872, pp. 173-179, 1990. Ramkumar, R.L. and Whitcomb, J.D., “Characterization of Mode-I and Mixed-Mode Delamination Growth in T300/5208 Graphite/Epoxy,” Delamination and Debonding of Materials, ASTM STP 876., W.S. American Society for Testing and Materials, Philadelphia (USA), pp. 315-335, 1985. Russell, A.J. and Street, K.N., “Moisture and Temperature Effects on the Mixed-Mode Delamination Fracture of Unidirectional Graphite/Epoxy,” Delamination and Debonding of Materials, ASTM STP 876., W.S. American Society for Testing and Materials, Philadelphia (USA), pp. 349-370, 1985. Arcan, M. Hashin, Z. and Voloshin, A., “Method to Produce Uniform Plane-Stress States with Applications to Fiber-Reinforced Materials,” Experimental Mechanics, Vol. 18, No. 4, pp. 141-146, 1978. Amstutz, B.E. Sutton, M.A. Dawicke, D.S. and Newman Jr., I.C., “An Experimental Study of CTOD for Mode I/II Stable Crack Growth in Thin 2024-T3 Aluminum Specimens,” national symposium on fracture mechanics Fracture Mechanics ASTM STP, American Society for Testing and Materials, pp. 256-271, 1995. Heydari, M. H. Choupani, N. and Shameli, M., “Experimental and Numerical Investigation of Mixed-Mode Interlaminar Fracture of Carbon-Polyester Laminated Woven Composite By Using Arcan Set-Up,” Appl Compos Mater, Vol. 18, No. 6, pp. 499-511, 2011. Gdoutos E. E., “Fracture Mechanics,” Second ed., Springer, Greece, pp. 15-57, 2005.